Mitchell Heller (Robert Bray, who later played Corey Stewart, the forest ranger who adopted Lassie), an overworked astronaut, is marked as a murder suspect after his worst enemy, Major General Addison Brand (James Coburn) is murdered. The police figure Heller had motive since Brand stole his job and his girlfriend, and was suspected of stealing his valuable invention. Perry believes Heller is innocent, and now he must figure out how a dead man can talk. This is the episode where Paul�resisting all the way�goes for a spin in a simulated space capsule. Character Names: Jeanne Bal�s character is actually Dr. Linda Carey. The omission of her title from the closing credits is puzzling, as her actions and decisions as physician in the Human Factors section of Project Moonstone is rather important to the plot. (They left in Brand�s title as General, after all, and he�s retired.) Additionally, Sewell�s first name is Jamison. Submitted by gracep, 12/23/2010. Jeanne Bal appeared on the first aired episode of Star Trek on 9/8/66. (Counting the two pilots, it was the sixth episode filmed.) Submitted by Wiseguy70005, 6/25/12. + Jeanne Bal also had a part in TCOT Misguided Missile, which also had a space program theme. Maybe she had a flair for aeronautics. JohnK, 18 October 2015. Sightings: We see a few regulars in the courtroom gallery today. �Miss Carmody� is in the front row, behind the defense table; later she moves to the back row. The Pencil Mustache Man is hiding in the shadows in the back row. Quiet Old Man #1 also appears in the back row, near the end. Submitted by gracep, 12/23/2010. The famous opening movement of Beethoven�s Fifth Symphony is playing on the hi-fi when the body is discovered. (That�s Symphony No. 5 in C minor, Op. 67, for the erudite viewers.) Submitted by gracenote, 7/20/2011. This episode features a Polaroid Camera (possibly the J66) although they do not refer to it by the brand name. Submitted by Mason Jar, 7/27/2011. CARS. (1) 1962 Buick LeSabre 2-Door HardTop, dark color, Mitch Heller. (2) 1962 Buick Electra 225 4-Door HardTop, medium color w/ white roof. Probably Addison Brand's: it's parked in front of his "Winslow Lodge" each of the 3 times we go there. (3) 1962 Mercury Meteor 4-Door Sedan (2dr shown), light color, Bonnie Winslow, parked at Winslow Lodge on Mitch's first visit there. It has a Temporary Permit pasted to the right side of rear bumper in lieu of licence plate (also see "Perry's new Lincoln", Car 2 in Ep#144). (4) 1962 Ford Galaxie 4-Door Sedan POLICE B&W, Brice driving Anderson & Tragg. Added by Gary Woloski, 3/31/13. 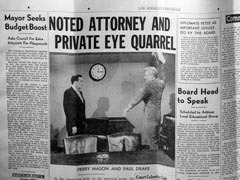 You can't say it's exactly (or even remotely) like Tracy and Hepburn, but both Paula Raymond and Steve Brodie previously appeared in Episode #72, "TCOT Garrulous Gambler," as well as in the granddaddy--and, arguably, the best--of all dinosaur-on-the-loose movies, "The Beast from 20,000 Fathoms" (1953). Submitted by BobH, 22 December 2016. "They're Getting Promoted (and Retiring) Much Earlier Than They Used To." James Coburn was nothing if not flexible. In this episode, he plays "Retired" Major General Addison Brand. Coburn was 33 years old when the episode aired. Submitted by BobH, 28 April 2017. + Almost every episode includes at least one actor who appears, as Coburn does here, decidedly older than their reported age. My guess is that many performers faked their DOB to take some years off their age. Either that, or life was REALLY hard on these people and they aged much faster than we do now. Coburn doesn't look retirement age, to be sure, but...33? Hard to believe! Submitted by JazzBaby, 3/11/2019. In the test lab scenes, on the table near the video display, there sits a Heathkit oscilloscope. It looks like a model OM-2. I had one of these at the time. I guess Winslow Aeronautics was trying to save money on test gear. Posted by daveb, 11/23/10. +"General Brand, Meet Tom Swift." Winslow's cost-cutting measures extend well beyond its test gear. Some of the rocketship drawings on the walls of the Winslow offices look like they were borrowed from the covers of several 1950s Tom Swift, Jr. novels. One can easily understand General Addison Brand's concerns about the future of the U.S. space program if it had to depend on Winslow's production line. Submitted by BobH, 22 August 2016. This is another one of my favorite episodes as it involves technology from the Space Age. Submitted by gracep, 12/23/2010. + And Real History from the Space Race: "Project Mercury" was mentioned twice, and astronauts "Grissom, Shepard & Colonel Glenn" once. Submitted by History teacher Mike Bedard, 2/2/2015. Paul Drake as guinea pig and the scene involving the newspaper article pictured above make this one a delight, too! Submitted by gracenote, 7/20/2011. And then there is the lovely Jeanne Bal � wow! Submitted by Mike Reese, 11/26/2011. + Amen to that! Submitted by 65tosspowertrap, 10/23/2013. + Indeed! PM features many beautiful actresses, but she is top of the list, in my opinion. I always thought Bones McCoy scored THE most beautiful love interest on ST TOS with her as his old flame in THE MAN TRAP, despite Capt. Kirk's way with women! Submitted by JazzBaby, 3/11/2019. Anomaly: General Brand & Major Heller were identified as former Air Force officers, but the murderer says on the witness stand they knew each other "in the Army." Submitted by Mike Bedard, 2/2/2015. + The USAF was originally a division of the Army, so depending on the time frame, that might make sense. Submitted by Notcom, 011916. Project Gemini was officially named in Jan. 1962 & continued through the Gemini 12 splashdown of Nov. 1966: "The...program consisted of...19 launches, 2...uncrewed, 7 target...and 10 crewed... each...carried 2 astronauts to...orbit," nssdc.gsfc.nasa.gov/planetary/gemini.html observes. Mike Bedard 3.16.15. "The Last of General Brand . . . and Sheila." As John K notes, the plot hinges on the murderer's ability to imitate General Brand's--i.e. James Coburn's--voice. More than a decade later, in the movie whodunit "The Last of Sheila" (1973), the plot again depends on the murderer's ability to mimic James Coburn's distinctive voice. Submitted by BobH, 29 April 2017. Yes, as I think about it more, the plot does seem a little far-fetched. The main clue is the metal strip from the Polaroid, but would the murderer really need to take a photo of the scene in order to re-create it again? A lamp and chair were tipped over, a few things on the floor. The witness isn't going to remember exactly where they were positioned.